Tibetan Herbal Shampoo is produced by the Russian beauty brand Planeta Organica. The product is formulated with organic red sandalwood oil and organic immortelle (everlast) extract. Made according to the ancient Tibetan recipe. Based on a combination 9 mountainous herbs. Stimulates hair follicles, making your hair grow strong and healthy. 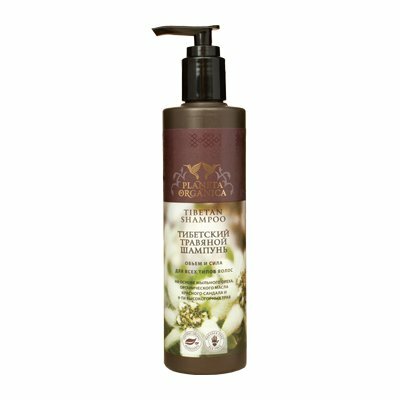 The shampoo contains Chinese soapberry (washnut) extract which is rich in vitamins A, B, E, minerals and polyunsaturated fatty acids. It enriches your scalp with nutrients and strengthens hair follicles. The extract also has natural cleansing properties. Red sandalwood oil stimulates hair follicles and skin cell metabolism. Immortelle extract contains vitamins C and K, tannins and carotene. It has anti-inflammatory and antibacterial properties, helps to soothe the scalp. Active ingredients contained in Tibetan herbs restore protein structure, helping to cope with hair brittleness and split ends. They strengthen hair roots, speed up hair growth and improve its structure along the entire length. The shampoo provides excellent hydration and nourishment and gives your hair extra volume. Ingredients. Aqua with infusions of Organic Pterocarpus Santalinus Wood Oil, Sapindus Mukurossi Fruit Extract, Leontopodium Alpinum Flower/Leaf Extract, Organic Helichrysum Arenarium Extract, Artemisia Vulgaris Extract, Organic Panax Ginseng Root Extract, Eugenia Caryophyllus (Clove) Seed Extract, Crocus Sativus Flower Extract, Curcuma Longa Root Extract, Solidago Virgaurea (Goldenrod) Extract, Thermopsis Alpine Extract; Magnesium Laureth Sulfate, Cocamidopropyl Betaine, Lauryl Glucoside, Decyl Glucoside, Glycol Distearate, Guar Hydroxypropyltrimonium Chloride, Benzyl Alcohol, Benzoic Acid, Sorbic Acid, Sodium Chloride, Parfum, Citric Acid. Want to buy Tibetan Herbal Shampoo? Call us or submit your order via our web site! my hair has been growing really fast since i started using this product. it has become really thick and strong. this shampoo is much gentler than the shampoo that mainly consist of strange chemicals, i can really feel that there are herbs in it.